The Ľubovňa Castle was built at the turn of the 13th and 14th century, when it became a part of the boundary castles system in the north of the Hungarian Kingdom. Besides the protection of the former Polish-Old Hungarian border, its task was to secure the important trade route passing along the valley of the Poprad river to Poland. In 1412, the historical meeting of the Old Hungarian ruler Sigismund of Luxembourg with the Polish king Vladislav II took place in the Ľubovňa Castle. The Castle was pledged to Polish kings and became the seat of Polish mayors, i.e. entrusted administrators of pledged Spiš towns. 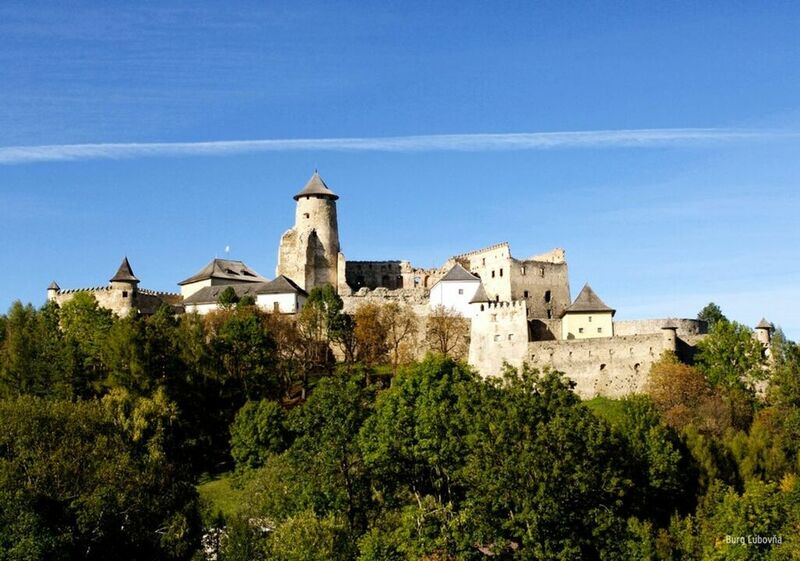 Through a reconstruction accomplished after a great fire in 1553, the Ľubovňa Castle obtained a more modern shape of a Renaissance fortress. After the return of the Spiš towns to Old Hungary, the role of the Castle diminished and the Castle itself fell in decay. Later on the Castle was successfully reconstructed and the castle museum exhibitions have been installed there. In 1991, the castle chapel was reconstructed and re-consecrated. Regular church services are still held there. An independent museum exhibition is presented by an open air museum in the area at the foot of the castle hill. It consists of a set of folk buildings that form a picturesque settlement around the Castle. Posledný vstup o 15:00 hod. Počas štátnych sviatkov zatvorené. Posledný vstup o 16:00 hod. Otvorené aj počas štátnych sviatkov s výnimkou Veľkého piatku. Posledný vstup o 18:00 hod. Otvorené aj počas štátnych sviatkov. Posledný vstup o 16:00 hod. Počas štátnych sviatkov zatvorené. Posledný vstup o 14:00 hod. Počas štátnych sviatkov zatvorené.